In the article about the electric charge and the types of electric charges explained that like charges repel each other while unlike charges attract each other. In other words, positively charged objects attract negatively charged objects, positively charged objects repel positively charged objects, and negatively charged objects repel negatively charged objects. This event shows the existence of the electrical forces acting on positively charged objects and negatively charged objects. What factors influence the electrical force between electrically charged objects? French physicist Charles Coulomb (1736-1806) conducted a series of experiments in the 1780s to investigate the factors that affect the magnitude of the electrical force between electrically charged objects. The device used by Coulomb resembles a device used by Cavendish to investigate the gravitational constant, called a torsion balance. Coulomb investigated the force of electricity, so he used two electrically charged metal balls, while Cavendish investigated the force of gravity, so he used two balls of mass that were not electrically charged. Based on experiments carried out using a torsion balance, Coulomb found several things. – In this experiment, the distance between the two solid balls is always the same. When the amount of electric charge on solid ball 1 is 1, and the amount of electric charge on solid ball 2 is one then the electrical force acting on both solid balls is 1. When the amount of electric charge on the solid ball 1 is 2, and the amount of electric charge on the solid ball 2 is two then the electric force acting on both solid balls is 4. Coulomb concludes that the magnitude of the electric force acting on both solid spheres is proportional to the product of the magnitude of the charge on one, Q1, times the magnitude of the charge on the other, Q2 (F ≈ q1 q2). Coulomb’s law is one of the physics laws that explain the relationship between the force of electricity, the electric charge and the distance between electrical charges. This law was formulated based on experiments conducted by Coulomb as described in the previous article. Coulomb’s law states that the magnitude of force exerted by an electrically charged particle to another electrically charged particle is directly proportional to the product of multiplication the charges of both particles and inversely proportional to the square of the distance between both particles. This force works along with a straight line connecting the two particles. Particles which have like charges repel each other, while particles which have unlike charges attract each other. F21 is the force exerted by the charge of q2 on the charge of q1, while F12 is the force exerted by the charge of q1 on the charge of q2. 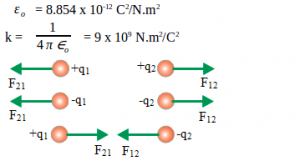 F21 and F12 repel each other when the type of charges of q1 and q2 are not same and attract each other when the type of charges of q1 and q2 are not same. F21 and F12 have the same magnitude, opposite directions and work on different objects, so both of these forces are a pair of action-reaction forces.